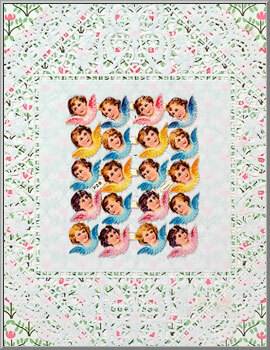 This sheet has 20 assorted die-cut angel faces. They are all about 1" wide by ¾" high. Glowingly printed in bright, pastel hues, the clarity of color and detail on these scraps is wonderful. Produced during the 1930's, they were made by the well-known scrap relief manufacturer, the Paul B. Zoecke company of Berlin, Germany. The embossed die-cuts were printed on standard weight paper and have a soft, satin finish gloss. Original full sheets were marked with the publisher's trademark of "PZB" and "Printed in Germany" along with the item number "32881."